The Extreme X299 Photoshop Editing System is designed by ImageScience, a leading professional imaging vendor. This PC will give you maximum image editing performance with Photoshop and Lightroom-type applications. Give us a call on 1300 353 200 if you'd like us to explain these choices to you in more detail - we're here to help! To buy, just dot one of each of the above choices - then press "Add to cart" to see the total when you have made any changes. Parts marked with a * are required to make the system work. You can choose to self-assemble and install your own O/S. If you'd like to add other items, such as keyboards and mice, just browse the site and press the "Add to cart" for each one. Choose from a watercooled 6-core (12 threads) 8-core (16 threads) or 10-core (20 threads) i7 CPU and up to 64Gb of fast DDR4 RAM. One ultra-fast M.2 SSD (Solid State Disk) for O/S, and a capacious spinning disk for storage. The 512Gb M.2 SSD can achieve read speeds of up to 2500mb/sec, vs 500+ for the 120/250Gb SSDs. The other SSD can be used by PS and Lightroom as a dedicated scratch disk folder location. All the SATA SSDs are similar in speed - the price roughly doubles with capacity doubling. We recommend you visit Image Science to find out more about the component selection process. 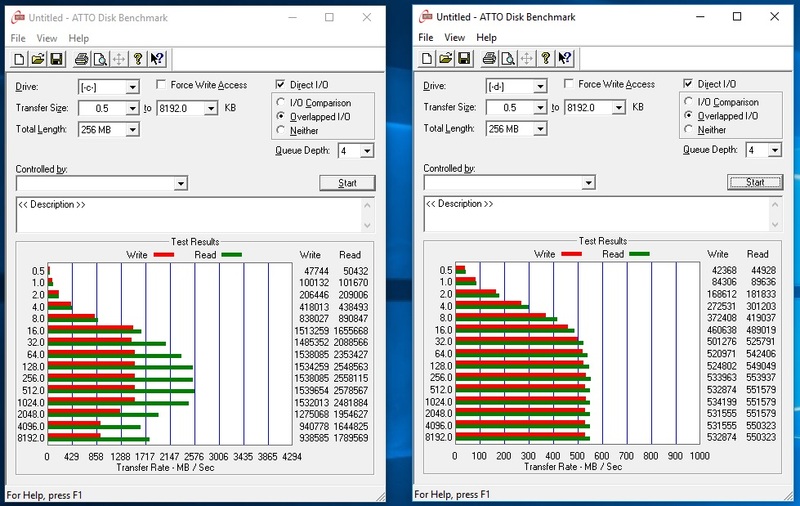 Below are the benchmarks from a reference system - C: is a 512Gb 950Pro M.2 Windows disk, D: is a SATA 1TB SSD. A spinning disk usually does no more than 120mb/sec vs 500mb/sec for SATA SSD vs 2500MB/sec for M.2 SSD.